free lift tickets for fifth graders. Superfast broadband internet is now operational, just in time for the holidays. Our comfortable condo in the Gold Creek building is very close to the Ski lifts, including the high speed quad, the 'Chili Express'. We measured the distance with a laser rangefinder, and it is only 280 yards to the Chile lift line. Great views of Wheeler peak from here, and summers are delightfully cool and refreshing at 8600 feet elevation. Get away from that Texas and Oklahoma heat for a while, and enjoy golf, fishing, horseback riding and hiking in the beautiful Moreno valley of northern New Mexico. The unit has no AC.... even in the summer, it is cool with a window open. Climb the tallest summit in New Mexico, Wheeler Peak, at over 13000'. Fishing for trout and yellow perch is terrific in Eagle Nest Lake, and anglers can ply the forest streams for coldwater trout. Hunters will find abundant elk, some deer and blue grouse nearby on National Forest land. The fall is particularly breathtaking, with the aspens coloring the mountains in a golden patchwork, and the wily bull elk bugling in the distance....a uniquely wild sound of the mountains. In the winter, skiing is king, and snowboarders love the new terrain parks. Ample snowmaking will keep your family on the slopes even when other resorts run out of snow. This unit is close enough to head home for lunch and avoid those overpriced burgers at the slopes. If your younger skiers tire before the lifts shut down, they can find refuge and snuggle up in front of the toasty wood stove and enjoy a few cartoons or movies (DVD or VCR). The unit has electric radiant heat throughout, but the wood stove is more fun! Firewood is stacked behind the condo building. Shoppers and historians will enjoy Taos, a mere 35 minutes or so away, with many artisans shops, restaurants, and a lengthy history going back to the Spanish explorers hundreds of years ago. The area is so appealing that many movie stars have their homes here, including Julia Roberts. Or head down to Santa Fe for even more variety, about 90 minutes away. Note: Our prices are listed below. We do not collect taxes (typically another 12.5%), nor extra booking fees. We do charge a $75 cleaning fee and $50 for each well trained dog you bring along. No telephone, bring your cell phone. Please note: We consider reservations confirmed at the time we receive payment. Until that time, dates from your inquiries are not guaranteed. Angel Fire is a family oriented ski and snowboard area, the best one for families in New Mexico... and it has the fastest lifts! So when we bought a ski condo, naturally it was in Angel Fire. Our kids were 6 and 8 years old at the time. We also love the hiking and fishing in the area, and enjoy the wonderfully cool summers as a getaway from Albuquerque. We like to go backpacking up Wheeler peak and camp in a secluded basin, and watch bighorn sheep from our camp. Our kids are teenagers now, and they out ski us easily, but no problem... we meet up at the condo when they make it back. Best place in NM.... a very friendly community. Angel Fire offers the best all around, year round recreation opportunities. Our place is so close to the lifts that we can go back to the condo for a break, nap or lunch and then continue skiing afterward. Keeps the place toasty and warm, glass pane to see the fire. 3 big LCD TVs, all with cable and HBO. Bring your own DVDs, or rent some in town. Perfect place for family ski vacation! Our young family has had a dream to ski together since our youngest was born 7 years ago. Steve and his team helped make this dream come true! Thanks Highly recommended! We visited during the winter and location was great for getting on the slopes. Used Village Sports next door for rentals and never needed to use vehicle after arrival other than a grocery run. 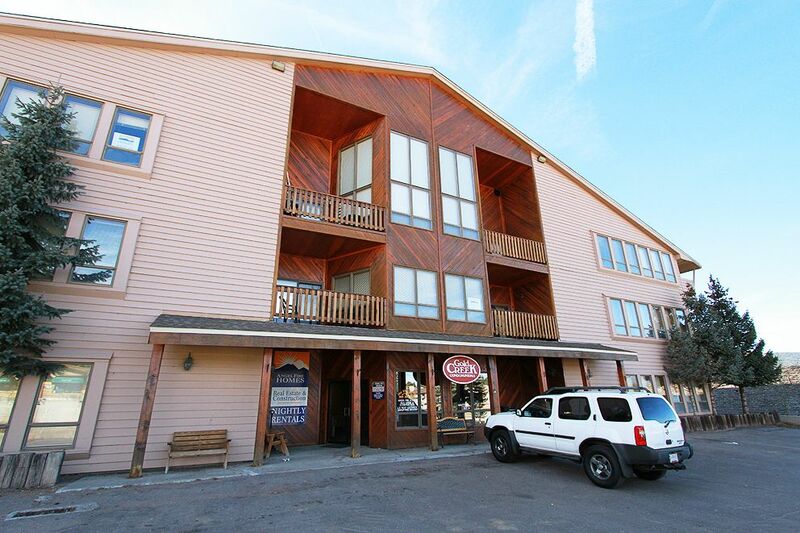 This is a functional condo, worked well for our family of 5, and is ideally located for easy access to the slopes. It is properly equiped for self-catering and has a convenient ski locker on the ground floor. Note that there is no lift and there are 2 flights of stairs to lug all your stuff! The hot water is piping and when the fire gets going, it keeps the place warm and cosy. There are a few maintenance issues (not major) but listed below for the owner’s information. Recommend that you bring toilet paper, matches/fire lighter, extra fire starters, and lots of quarters if you are planning on doing any laundry as there is nowhere to get change. We were very comfortable here once we got the heat going. Radiator in lounge area does not work, although heat may be provided by fire in that area, garbage disposal does not work, several drawers in bedrooms and kitchen are broken and fall out when opened, master bedroom light buzzes at volume, bathroom extractor fan clatters loudly and does not seem to be working, shower on/off is coming away from the wall, dishwasher soap dispenser does not work. We found a huge glob of hardened detergent in it on arrival that we cleaned out but when we ran the cycle, the soap did not release. This would probably explain why so many of the kitchen items were so dirty! While these issues did not detract from our enjoyment of the condo, I am sure that fixing them would add to the pluses of this property. Great place, close to the lift and you can't beat the price! This condo was perfect for our purposes. My husband and I had a bike race and this condo was close to the base so we could pop in on the kids and in-laws as needed. It was close enough that they could wander up to the lift and watch and still get back for naps. We had a little snafu on the arrival but Steve was so responsive and fixed the problem as fast as he could. So, that didn’t really impact our stay. Thanks for letting us use your home. There will be one payment for the rental and a separate $500 security deposit, which will be fully refunded when we confirm everything is in order. We offer a fifth night free! ( but not during Christmas and Spring Break Periods). 10% discount for repeat customers.